Some records of the manors and mines shown on the detailed map are available for study. The church is dedicated to St. John the Baptist. With the current boundaries the area is now 2,284 acres plus 6 acres of water and 64 of foreshore [ GENUKI 1997]. It's population has varied little over the years with most of the growth being in Sennen Cove. The later figures were obtained from from the Country Socio-Economic Statistics of Sennen civil parish. * Source unknown. The GENUKI page quotes figures for Sennen Cove village (1981 = 195, 1991 = 205) and Sennen village (1981 = 560, 1991 = 645) separately but it is not certain if these are included in the census totals in the table above. Sennen Cove (covers Churchtown as well) by Terry George has information about the lifeboat station, surfing and local issues. The Sennen OPC Website run by George Pritchard, a past OPC for the parish. Another Sennen Cove web site! This one from Brian Poulton called Sennen Cove—Looking Back. Cornish Light, the Travel and Tourist Guide, have a page devoted to Land’s End & Sennen Cove. SOSKernow (friends of Cornwall) have a detailed history of Sennen church. Paul Stephens’ amazing Panoramas includes incredible 360° views from Sennen Cove and the Land’s End point. There have been suggestions that Domesday Book, folio 125a, chapter 5,24, paragraph 24, WITESTAN refers to Whitesand. Current thinking is that this is in the parish of Whitstone in North East Cornwall [Thorn 1979]. This parish takes its name from its tutelar saint S. Sennan or Sinninus an Irish Abbat who saith Leland, was at Rome with S. Patrick, and came over from Ireland to Cornwall with S. Breage. The Church hath dedicated the 30th of June to his memory. It is a daughter church to S. Burien, and is valued together with that and S. Levan, in the King’s Book, at £48 12s. Sennen, in the deanery and in the west division of the hundred of Penwith, is the most westerly parish in England, lying near the Land’s-end, about eight miles and half west-south-west from Penzance, which is the post-office town. The principal villages in this parish are, Mayon (called by Martyn, Mean), Penrose, and Trevear. Mean is the last village towards the Land’s-end. The large stone spoken of by Dr. Borlase, called Table-Mean, concerning which there is a tradition that three Kings once dined together at it on a journey to the Land’s-end, is in this village, in which is a house of entertainment for travellers: on the western side of its sign is inscribed, “The first Inn in England;” on the eastern side, “The last Inn in England.” The Land’s-end, which, according to Dr. Bergerf, is 391 feet above the level of the sea; Cape Cornwallg, and Whitsand-bay, are in this parish: it was at this bay that King Stephen landed on his first arival in England; also King John on his return from the conquest of Ireland, and Perkin Warbeck in the reign of Henry VIII. : near this bay is the site of an ancient castle, called Castle-Mean. The manor of Mean or Mayon, as it is now spelt, belongs to Sir John St. Aubyn, Bart., and Dionysius Williams, Esq. The barton of Penrose was, in the reign of Queen Elizabeth, the seat of the family of Jones: it is now the property of Lord Falmouth. The barton of Treveare was some time the seat of the Ellis family: a part of this estate was, by purchase, the property of the late rev. Edward Giddy; the remainder belongs to —— Thackworth, Esq. The houses on these bartons are now occupied by farmers. Cape Cornwall with a distant view of the Land’s End. Sennen is parcel of the deanery of St. Burian, to which this is a daughter-church: the dean has the great tithes. There are the remains of a chapel near Whitsand-bay. 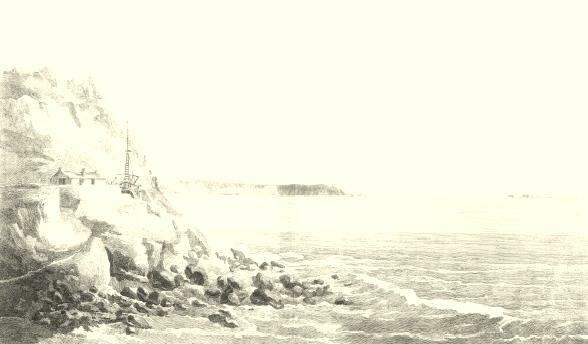 On one of the rocks called Longships, off this coast, is a light-house constructed in 1797, by Mr. Smith, under the directions of the Trinity-house. f See his Paper in the Geological Transactions. The portion of Treveare which belonged to the late Rev. Edward Giddy, is now the property of his son, Davies Giddy, Esq. M.P. SENNEN, a parish in the hundred of Penwith county of Cornwall, 8¼ miles (W.S.W.) from Penzance, containing 3637 inhabitants. The living is a perpetual curacy, in the jurisdiction of the royal peculiar court of St. Burian, and in the patronage of the King, as Prince of Wales. There is a place of worship for Wesleyan Methodists. 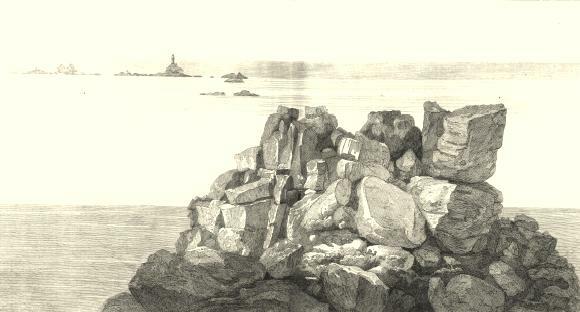 In this parish are, the Land’s End, which according to Dr. Berger, is three hundred and ninety-one feet above the level of the sea; Cape Cornwall; and Whitsand bay: it was in this bay that King Stephen landed on his first arival in England; also King John, on his return from the conquest of Ireland; and Perkin Warbeck, in the reign of Henry VIII. : near it are the site of an ancient castle called Castle-Mean, and the remains of a chapel. On one of the rocks, called the Longships, off this part of the coast, is a lighthouse, constructed, in 1797, under the direction of the Master and Wardens of the Trinity House.